Elsewhere, ATK look to revive their flagging campaign as they run the home gaunlet with five games on the trot. It is another action packed week of football in the ISL as we near the business end of the competition. The games have started coming thick and fast now and all teams would be looking to outdo each other to stay alive in the competition. FC Pune City has emerged has one of the most well-drilled sides in the competition and are looking good for making the playoffs for the first time in their history. The Stallions form at the Balewadi initially was poor though, losing 3 out of their first 4 games, but have since then somewhat redeemed their home record scoring thumping victories in their last two homes games winning 5-0 and 3-0 against NorthEast United FC and ATK respectively. The Stallions will be up against a Jamshedpur FC side who will be brimming with confidence after securing gritty wins in their last two games. They will be particularly pleased with how they came from behind after being 0-2 down to win 3-2 against Delhi Dynamos in their last game. After scoring just 2 goals in their first 7, the Men Of Steel have started finding the back of the net with more ease in their last few games. FC Pune City had the last laugh in the reverse fixture this season when they won 0-1 courtesy an Adil Khan goal. FC Pune City are a side brimming with attacking talent and the Brazilian winger Diego Carlos has stood out with his performances. A trickster with pace and skill in his repertoire, Diego was an absolute menace to the ATK defence in the last game and would look forward to carry that same vein of form in the next game. Jamshedpur FC, on the other hand, would be looking to bank on the recent good form of Jerry Mawimihthanga. The young Mizo lad has been instrumental in the men of steel’s recent upturn in fortunes, with the winger assisting thrice and scoring once in the last 4 games. 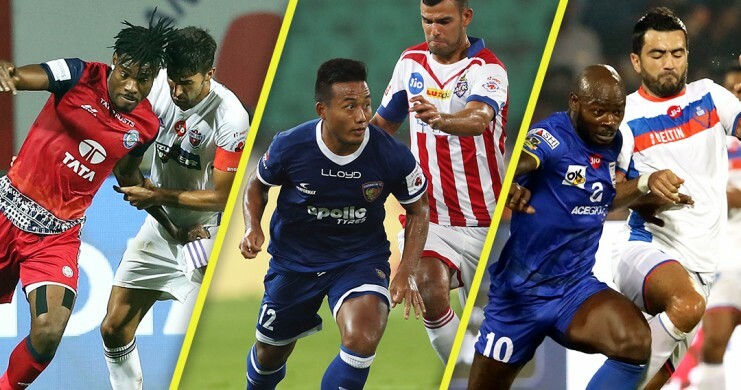 ATK begin a run of 5 straight home games when they take on high fliers Chennaiyin FC in Kolkata on Thursday. The defending champions have blown hot and cold over the course of this campaign and are currently in 8th position with just 12 points from 10 games and are in real danger of missing out on even the play-off places this season after a thumping 0-3 loss against FC Pune City. The two time champions from Kolkata will be looking to maximize the returns from their run of 5 straight home games to have any hopes of emulating the results of last season. On the other hand, High flying Chennaiyin FC were brought down crashing to earth after suffering a 1-3 loss away to strugglers NorthEast United FC in their last game, before that they were on a 5-match winning streak. The Marina Machans have looked a solid side this season under coach John Gregory and are well placed to make the play-offs, but with the race hotting up for the top 4 slots they wouldn’t want to lose further ground. That last time the two sides met in this season, the home side Chennaiyin won 3-2 in a game that went down to the wire, with all 5 goals coming in the 2nd half. Scoring has been area of concern for ATK and they would expect explosive winger Zequinha to be among the goals come Thursday. The Portuguese winger with his raw pace has tormented opposition defenders and has looked the most dangerous in the ATK ranks. For Chennaiyin, Raphael Augusto holds the key to a good result as usual, the Brazilian midfielder is one of the most technically gifted players in the competition and would look to run the show against ATK. Bengaluru FC are riding a wave of success in their maiden venture in the ISL and are playing a brand of eye-catching one-touch football. They are currently on the top of table with 22 points from 11 games and would look to move a step closer towards the play-off places when they host NorthEast United FC at the Sree Kanteerava stadium on Friday. The Blues produced a masterful performance at the Mumbai football arena in their last game winning 3-1 over Mumbai City FC where in their fearsome attack clicked in full gear, they will be hoping a repeat a similar performance in front of their passionate home support against a NorthEast United side that sits second from the bottom. Though it is a going to be a tough game for the Highlanders, they will take heart from their memorable 3-1 victory over their more fancied rivals Chennaiyin FC in their last match. The change in management is for sure having some positive effect as the Highlanders have won two of the three games after Avram Grant has taken over. Bengaluru FC won 1-0 at the Indira Gandhi Athletic Stadium the last time the two sides went head-to-head earlier in the season. Bengaluru FC have a potent attacking line-up and the man keep an eye on will definitely be Miku who has proved to be one of the most accomplished foreign players in the competition and is jointly tied at the top of the goalscoring charts with Ferran Corominas. The Venezuelan striker netted the only goal of the match against the Highlanders and could again be a thorn in their necks come Friday. NorthEast United’s defence has their task cut out against such a free scoring team and their captain and defensive mainstay Jose Goncalves could provide the necessary inspiration in keeping Miku and co. at bay. Goncalves along with his central defensive partner Sambinha had a really good game against Chennaiyin FC and didn’t allow their forwards to have much impact on the game. The Blasters will look to register full points against bottom of the table Delhi Dynamos who have been absolutely poor this season. The Lions have now lost 8 out of their 11 games so far and would realistically, be only playing for pride in their remaining games as their chances of progressing to the play-offs are only possible mathematically. Kerala Blasters would be banking upon the heroics of wily midfielder Courage Pekuson to create chances for the likes of CK Vineeth and Iain Hume upfront to punish the Delhi Dynamos who have the worst defensive record in the competition. The 23-year-old Ghanaian has already 4 assists to his name. The Dynamos, on the other hand, would be encouraged by their frontman Kalu Uche’s return to goals. The former Nigeria international bagged a brace in the last match and would be looking for more in the games ahead. It will be a highly anticipated western derby as FC Goa lock horns with Mumbai City FC at the Fatorda Stadium on Sunday. The free-scoring Gaurs have been the most prolific side in the league and though they haven’t been as solid defensively, they are easily outscoring their opponents with the attacking talent at their disposal. FC Goa are currently 4th with 19 points from 10 games having a game in hand from the 3 teams above them and would be gunning for the full 3 points from the game that would put them at the top of the table. After a brief stutter in which the Gaurs lost against NorthEast United and Pune and drew against ATK in successive games, their campaign is back on track after registering two straight wins from their last two matches. Mumbai City FC, on the other hand, have lost their way a bit after being right there in the mix for a top 4 finish and The Islanders will be highly disappointed because of the home reverses in their last two games. Mumbai would rightly feel hard done by because of a contentious decision that resulted in a 0-1 loss to Kerala Blasters, but there would be no excuses for their loss in the next game as they were comfortably outplayed by a free-flowing Bengaluru FC 1-3.Hence the next match bears much importance for the Islanders and would want to come away with 3 points to keep up their pursuit for the playoffs. The other time these two sides met in the season Mumbai City FC recorded an impressive 2-1 victory over the Gaurs, but putting into consideration both sides current form, it may prove to be a difficult task for the Islanders to get one over the Gaurs this time. Much of FC Goa’s success this season can be attributed to the irresistible Spanish duo of Manuel Lanzarote and Ferran Corominas who have been absolutely fantastic for the Gaurs. Those two have shared 17 of the of the total 24 goals scored by the team till now and would most certainly be having an impact on the outcome of the match on Sunday. FC Goa has a brilliant attack, but interestingly are the only side in the competition to not finish with a single clean sheet this season. Mumbai FC would hope Everton Santos would exploit that chink in the Gaurs’ armour. The Brazilian has proved to be a good signing for the Gaurs already chipping in with 2 goals and 4 assists, possessing great dribbling skills and supreme vision, he can pose a few problems to the Goa defence. It will be clash between teams playing for the 2nd time in a week’s time, Jamshedpur FC’s Steve Coppell though would be the more worried of the two coaches as his side has played twice the previous week too and with all the travelling involved this week, he has to find ways to keep his team fresh for this clash. The home team ATK must get its act together and start getting the results in order to avoid falling out of the play-offs for the only time in their history. This window of 5 straight games provides them a great opportunity to seize control of their season. They will be up against a Jamshedpur side that would be buoyed their recent successful run of games and are just one place away from the play-off slots. Steve Coppell has successfully started getting his philosophies across the team as the Men of Steel have shown great character in the previous few games to secure important results. Ryan Taylor has been an important addition for ATK this season, the former Newcastle United has been a vital cog in the ATK midfield since his arrival and already has a few strong performances to show for it. Making well timed tackles and winning the ball back has been the hallmark of his game so far and also his deliveries from set pieces and open play can cause a lot of problems for Jamshedpur FC. Jamshedpur FC would be expecting Nigerian frontman Izu Azuka to be among the goals on Sunday. Azuka has been among the goals for the Men of Steel and his work-rate has also been impressive forcing opposition defenders to commit mistakes.